Preheat your oven to 180 °C. Lightly oil your flat baking tray with coconut or olive oil. Add the psyllium husks to a mixing bowl and gradually add the water until you get a thick, slightly gooey mixture. Spread the mixture out as even and thin as possible, without it separating. Bake for about 30 minutes, rotating accordingly. After 30 minutes take the tray out of the oven and break the cracker sheet into portions. Pop back into the oven for a further 20 minutes. You can also leave them in a warm oven overnight to further dehydrate. Once cooled, store in an airtight container. 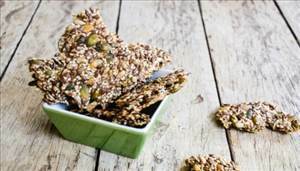 There are 66 calories in 1 serving of Mixed Seeds Crackers. Calorie Breakdown: 73% fat, 11% carbs, 15% prot.